An unremarkable solstice in California; but a hot second half of summer (and what about El Niño)? After a long stretch of tumultuous weather during much of 2017 and early 2018–ranging from record rainfall, continuing drought in the south, all-time record heat, and devastating wildfires (followed by equally devastating debris flows)–a relatively quiet spring and start to summer in California has offered a welcome reprieve. Temperatures have been pretty darn close to long-term averages in California’s most densely populated coastal areas, though much of the California interior has been continuing to run well above average. Spring precipitation across northern California was near or slightly below average, though unfortunately well below average in southern California (something that has become a bit of a trend in recent decades, as I discussed in a recent blog post). California’s uniquely chilly early summer coastal climate has been on full display in recent weeks: near-shore upwelling has been keeping coastal ocean temperatures in the low 50s off of the Bay Area, driving a robust marine layer. Further south across the the California Bight, SSTs are of course much warmer, but persistent “June Gloom” coastal cloudiness has been the rule. There have not yet been any searing heatwaves this season in California, though it is presently quite hot across inland desert and valley regions. All in all: conditions over the past few weeks have been pretty unremarkable–which is not at all unusual for this time of year. This weekend will likely be the warmest of the season so far in many areas, especially across NorCal and most inland portions of SoCal (the coastal plain of SoCal will mostly likely escape the heat this time, with things becoming merely “comfortably warm”). Triple-digit heat will be widespread in the usual hotspots, and dry/gusty winds in the hills will lead to elevated fire weather concerns. This does not appear to be an extreme wind event by any means, but vegetation is now dry enough that winds will carry a fire quite quickly. Fortunately, it does appear that this weekend heatwave will be pretty short-lived, with temperature cooling back down to near average for much of next week (and fog may once again return to the immediate coastline). 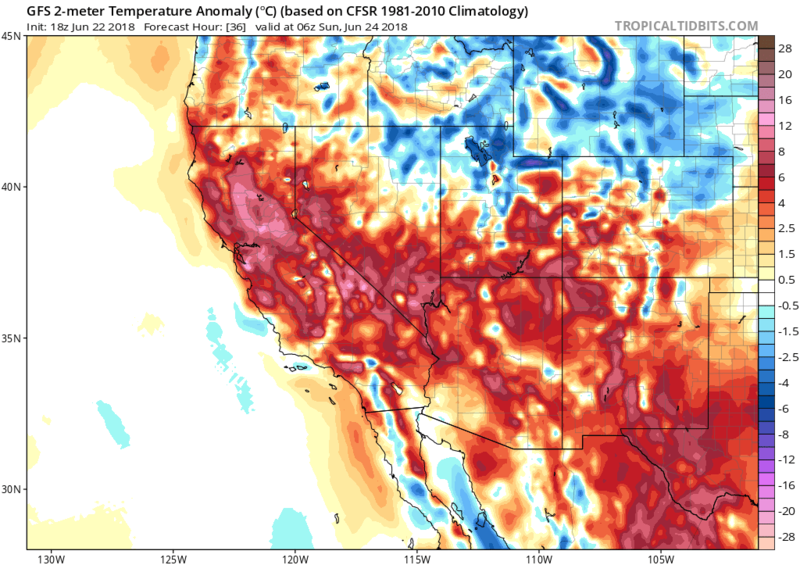 Mid June is typically when the long-range weather models start hinting at slightly more interesting California weather in the extended range, and this week is no exception. Several major East Pacific hurricanes have already occurred this season, though their remnant circulation and moisture have been deflected both to the east and west of California so far. There are currently hints that a new tropical system or two may develop west of Mexico about 7-10 days from now, and large-scale flow may be somewhat favorable for remnant moisture to take a closer approach. That’s still speculative at this point, and not too unusual in the week two outlook. But it’s something to keep an eye on beyond the recurring morning stratus! Looking even further ahead using some of the newer sub-seasonal forecast models, there is pretty strong consensus that our relatively mild start to summer will not persist through the second half. While the next 2 weeks still look relatively cool (this weekend excepted), the multi-model ensemble suggests a high likelihood of well above average temperatures during July, August, and September. Part of this arises from the expectation that SSTs will rise across the entire eastern Pacific later this summer as an El Niño event develops (see below), but there are also hints that the northwestern flank of the 4-Corners high may be stronger and extend farther westward than usual beginning by mid-July. There have been rumblings about an incipient El Niño event in the Pacific for some weeks. But now that we’re emerging from the so-called “Spring Predictability Barrier,” those signs are still quite prominent. In fact, virtually all coupled ocean-atmosphere seasonal models are at this point suggesting a high likelihood of El Niño conditions by autumn–and even a decent chance of a substantial event. Recent observations support this forecast–slight warming has begun at the surface of the ocean, but a much more impressive pool of anomalous warmth exists at depth across the eastern equatorial Pacific that is expected to begin surfacing in the coming weeks. This developing event may be partly to blame for model predictions of very warm conditions in California later this summer, as a coastal Kelvin wave acts to warm near-shore ocean temperatures. It’s still too early to say what implications there might be for the coming winter, although it does appear that there may be a chance of above-average East Pacific hurricane activity later this summer as the ocean warms. Stay tuned!